On December 16th 1944, Germany launched its last desperate offensive in the West. The result was the Battle of the Bulge, a brutal struggle in a dismal winter landscape, set against an enemy imbued with a fanatical conviction that victory could be snatched from defeat. It was the United States Army's greatest and fiercest battle of World War II. Over a million men and thousands of guns, tanks, and other fighting vehicles were engaged. In those "bitter woods", fighting against heavy odds, the American soldiers slowed and stopped the spearhead of two elite Panzer Armies, forever emblazoning themselves in the annals of military history. Compass Games presents the Designer Edition of this Charles S. Roberts and ORIGINS award nominee. New to this edition are enlarged, colour unit counters, additional scenarios, and an extended campaign game to allow the Allied counterattack to be fully realised. In addition to the 6 and 8 turn tournament games, Patton's famous relief of Bastogne can be recreated via scenario play. Specific rules include: Mechanised Exploitation Movement, Hidden Fuel Dumps, Leader Units, Reserves, Random Events, Bridge Demolition, Kampfgruppe Peiper Breakout, Skorzeny Infiltration, Air Power, and Artillery Support. 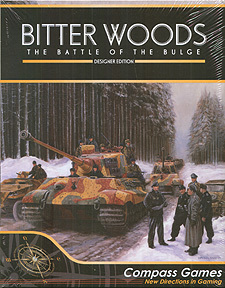 Bitter Woods: Designer Edition is the premier edition of this highly acclaimed regimental-level Battle of the Bulge game. The potential for mechanised exploitation movement and an appropriate Allied counterattack capability ensure an exciting challenge for both sides. Bitter Woods: Designer Edition is highly playable, yet historically accurate, further ensuring a game you will want to revisit for years to come.